Keeping true to the philosophy that "the music student comes first" has been a contributing factor in the success of Hewitt's Music. Founded in 1920 by Clarence E. Hewitt, Sr., Hewitt's can proudly claim to be one of the oldest family owned music stores in the United States. 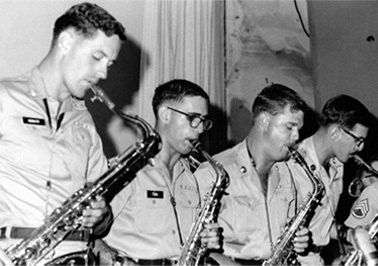 Four generations of Hewitts have carried the family name and tradition of providing complete service to all musicians ranging from the beginning student to the professional. Hewitt's Music also understands what it takes to be a music teacher. It is with this combination of years of musical experience that Hewitt's Music comes to you…proud to be a Michigan based business devoted to providing students with the chance to participate in the world of music. 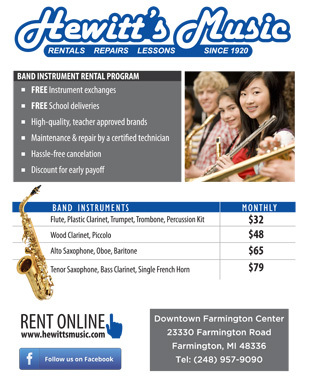 Hewitt's Music relocated to the city of Farmington, just minutes from major highways and convenient shopping. The move to this location is the result of a strategic plan to better serve Oakland, Livingston, Wayne and Washtenaw county school districts. Our new facility and increased size allows for full-time on-site repair services, more variety of private lessons and a larger, more diverse instrument inventory. Hewitt's Music sales representatives call on over 150 schools per week to service the needs of students and music directors. 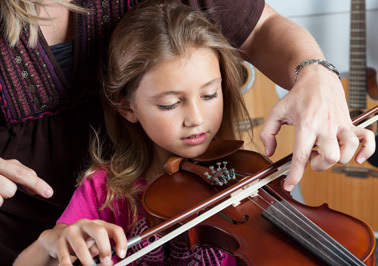 Our school service specialists can make free pick-up and delivery of instruments, repairs and accessories. Hewitt's Music also offers free instrumental clinics at schools that invite us to their rental meetings.